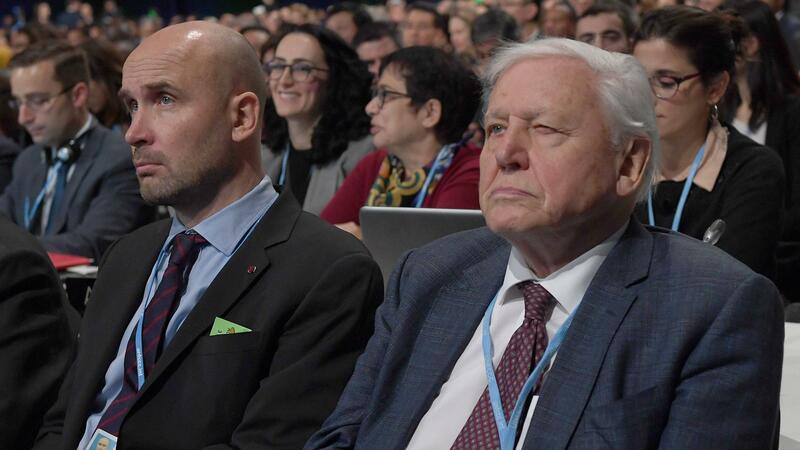 Natural historian David Attenborough listens to speeches during the COP24 summit on climate change in Katowice, Poland, on Monday. David Attenborough, the naturalist and broadcaster, sounded a dire warning in a speech Monday to the U.N. climate conference in Poland. "Right now we are facing a man-made disaster of global scale, our greatest threat in thousands of years: Climate change," Attenborough said as the international climate conference got underway with talks on how countries will implement the 2015 Paris Agreement limiting carbon emissions. "If we don't take action, the collapse of our civilizations and the extinction of much of the natural world is on the horizon." Attenborough, 92, was representing the people of Earth as holder of the "people's seat" at the conference. "I am only here to represent the voice of the people, to deliver our collective thoughts, concerns, ideas and suggestions," Attenborough said. He played a montage showing people from around the globe who participated in his speech by sending their own videos. "The world's people have spoken. Their message is clear. Time is running out," Attenborough said. "They want you, the decision-makers, to act now." Attenborough also promoted the "ActNow.bot," a Facebook campaign the U.N. is launching that will recommend actions people can take to protect the planet. Attenborough, who has produced and narrated numerous nature documentaries, is a strong advocate for fighting climate change — but that wasn't always the case. "I am always cautious about crying wolf. I think conservationists have to be careful in saying things are catastrophic when, in fact, they are less than catastrophic," he told The Independent in 2006. "Also, I'm not a chemist or a climatologist or a meteorologist; it isn't for me to suddenly stand up and say I have decided the climate is changing. That's not my expertise." The British environmental website Carbon Brief attributed Attenborough's change in perspective to a lecture by American scientist Ralph Cicerone in 2004, in which Cicerone showed graphs of world temperature, global population and the make-up of the atmosphere. "Now I do not have any doubt at all," Attenborough said two years after that lecture. "One of the things I don't want to do is to look at my grandchildren and hear them say: 'Grandfather, you knew it was happening — and you did nothing.'" At the conference in Poland, Attenborough said the U.N. provides a "unique platform" for uniting the world. But currently, the world is less than united in the battle against climate change. The Trump administration's withdrawal from the Paris Agreement — though not yet in effect — has left a leadership void that others are scrambling to fill and expanded the opportunity for China to shape global policy. Meanwhile, Brazil's new government is signaling a similar shift away from climate goals. And even as Attenborough assured world leaders that the people of Earth support "tough decisions" and are "willing to make sacrifices" to fight climate change, violent protests on the streets of Paris have sounded a different note. The "yellow vest" demonstrations, which have grown into riots across France, are motivated by objections to a new tax on gasoline set to go into effect in January. The controversial tax is part of French President Emmanuel Macron's larger plan to reduce France's reliance on fossil fuels, in order to cut greenhouse gas emissions and fight climate change. Some environmental advocates are discouraged by the fact that the meeting in Poland is taking place in in a city that is home to the biggest coal company in the European Union, according to the BBC. "Scientists say time is running short to avoid the most catastrophic effects of global warming. Climate change is already affecting communities around the world, and a slew of scientific and policy warnings have come out in the months leading up to this meeting. "In the U.S., extreme weather is damaging infrastructure, ecosystems, health and the economy. In November, the most comprehensive federal climate assessment to date called climate change 'an immediate threat, not a far-off possibility,' and detailed how every part of the country will be increasingly harmed as the Earth gets warmer."